You may have noticed that my computer changed color from silver to rose gold. That’s because I bit the bullet and upgraded to the newest MacBook Air! I bought an Air almost four years ago and loved it wholeheartedly. It felt new much longer than my other computers. I am Mac for life! When they came out with a new Air this fall, I started researching it and there were a few features that I really wanted to have – a smoother keyboard, a much larger and more sensitive trackpad, a better battery life (my old one’s battery wasn’t dead but it was slowly dying), and the fingerprint sensor to log on. 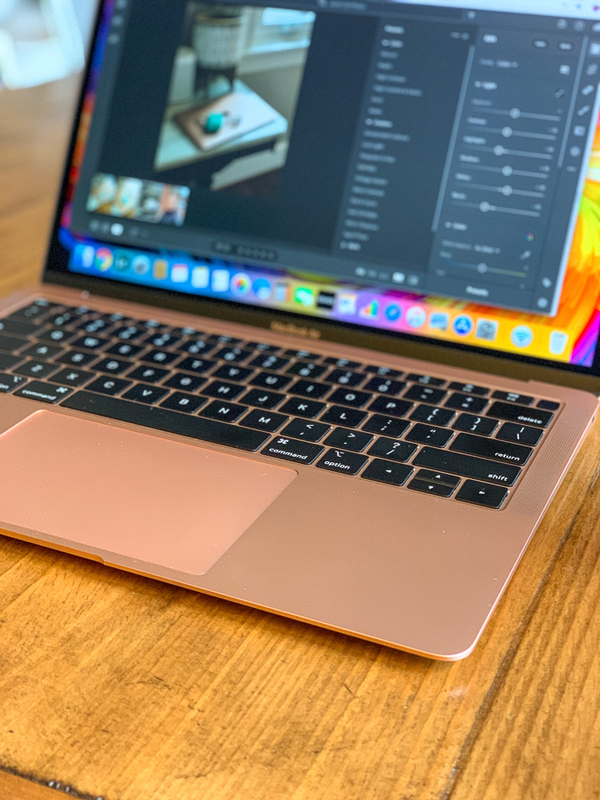 I was able to take my old one to the Simply Mac store here in Cville and trade it in for a few hundred dollars, so the cost of the new one wasn’t horrible. I am SO happy with the purchase! The features I was excited about are all so great. She’s a beaut! Upon getting a new laptop, I had to research new versions of Adobe Lightroom, which is what I use to manage my photo process for the blog. At first I wasn’t totally thrilled with switching from the desktop version of Lightroom to the new Creative Cloud option, which is a monthly subscription of $9.99. But it was nice not to have to buy the software up front, and I was immediately kicking myself for not doing this sooner when I realized all the improvements to Lightroom! The interface is much sleeker and has been simplified. I think it’s easier to use with shortcuts and a more visual design. My only complaint is the export process (but maybe I just haven’t quite figured it out yet?) I would love to be able to have pre-set export options remembered like the old version, but it seems you have to change the export folder and sizes manually each time. 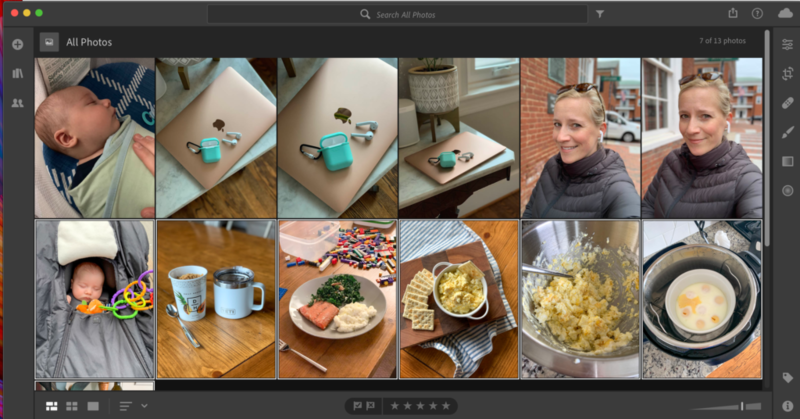 But the one thing that I LOVEEEE about the new Lightroom CC is that you can auto sync photos from your phone to the desktop version through the app. I used to AirDrop all of my photos from my iPhone to my computer and drag them to a watched folder, which wasn’t hard but it was an extra step. Now they just appear – magically – in both the app and desktop version until I edit, export, and delete them! This is saving me so much time and ensures I never miss a cute photo of Mr. Birch or a meal. Next on the new list is a set of AirPods! I’ve used various Bluetooth devices in the past (this is my $18 one that I like a lot and still use for specific things). Thomas bought AirPods a while ago, and over Christmas I borrowed his a few times just to test them out. Of course that was a “mistake” because once I started using them I realized what I was missing. 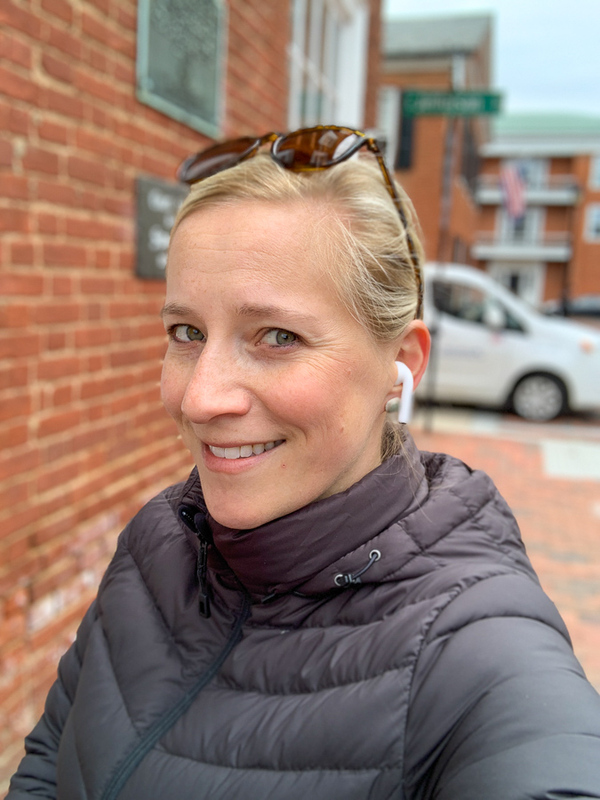 What’s so cool about AirPods isn’t the design or the sound quality – it’s the usability!! Usability is what Apple does best, from syncing everything on the cloud to iMessage to auto detection and AirDrop. When I say usability, I mean that your iPhone or MacBook automatically detects the AirPods, that the battery percentages automatically show, that they auto turn on when you put them in your ears and auto pause when you take them out. So in short, just like the Lightroom improvements, my headphone efficiency has been maxed out : ) And obviously the design and sound quality are secondary pros. If you’re wondering, I haven’t had any trouble with them falling out on a run. And see that cute little case? 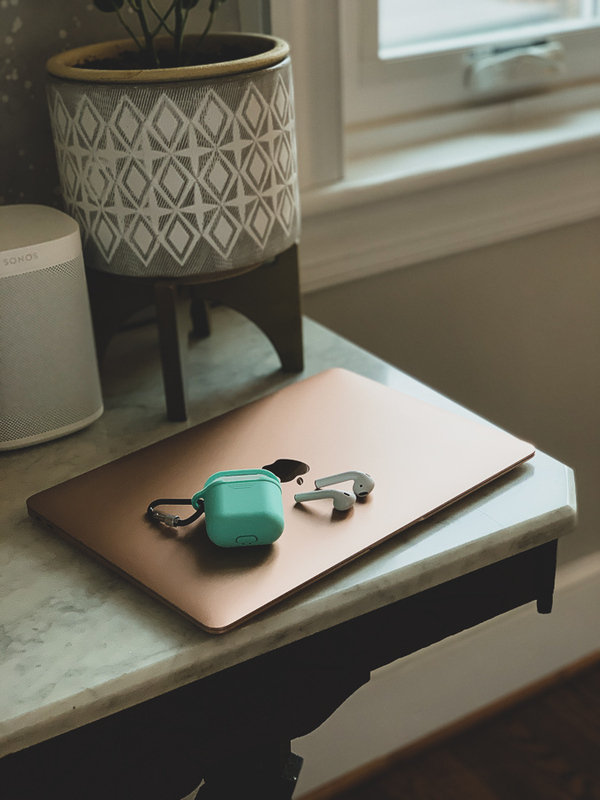 I bought it on Amazon to help us tell our AirPods apart and because I love the color and little hook. It slides on perfectly and keeps them save too. Finally, I was invited to put together a little Amazon Store with some of my favorite things. 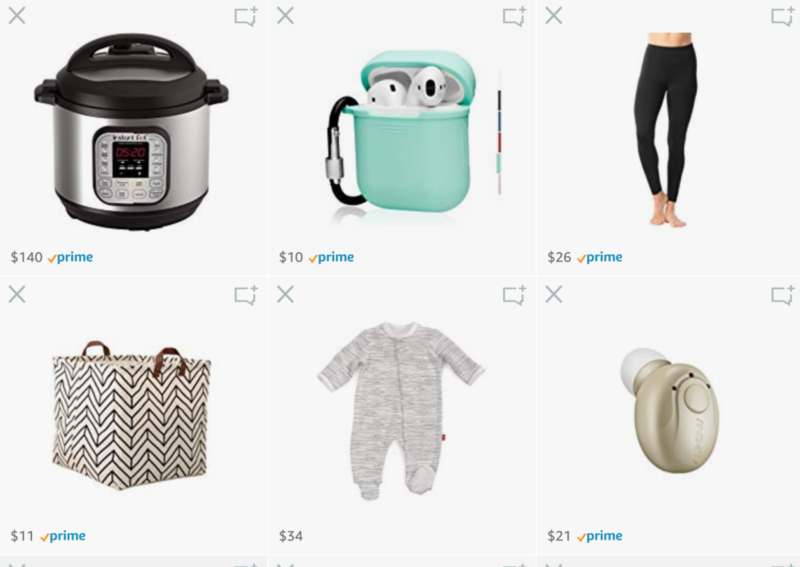 I’m only including things I have actually bought and mentioned because I often get messages from you guys asking me “What was the vacuum you love again?” or “Which leggings were only $26 on Amazon?” This way I can point you guys to the store where everything is in one place. Again, these are only things I have actually bought and not a wish list of random Amazon things. Gorgeous new Mac book! The color is so amazing. Well my old computer is gone so this one just replaced the old one. Same with the headphones – replaced all old pairs. So technically I don’t really have any more items in my house. I tend to have an out with the old and in with the new mentality about anything new I purchase. If I get a new pair of tennis shoes, I donate my old ones, etc. I would not call myself an extreme minimalist under the definition of number of items, but decluttering and simplifying are always goals of mine. I agree, minimalism means different things to different people. But at its core it seems to me to mean the purposeful, intentional refusal to buy into the “I need this” mindset–to make do with what you already have, and to do without. I just read this somewhere and it resonates a lot with me: “Minimalism brings freedom from the all-consuming passion to possess”. So we refuse to buy into the “my phone is a couple years old so it is time for an upgrade even though my current phone is perfectly functional” or “I’ve had this shirt for a few seasons so it must be time for a new one”. Again, it can mean different things to different people, but if someone continues to consume and participate heavily in our consumer-based society, this seems to me to be very counter to the goals that minimalist living strives for. To me, organization and decluttering are very different than minimalism. Ahhh I need a new MacBook! And I’ve been thinking about getting AirPods, too. I’ve seen your insta posts where you were working out with them, I’m glad to see they stay in place for workouts. My sister has been telling me how great air pods are but I haven’t tried them yet. Your coppery laptop is very pretty. I guess the minimalism thing is a bit confusing though. I’m not a minimalist myself, but I thought it was more about owning fewer items overall, and buying a few high quality things that last a long time and don’t need upgrades. This isn’t aimed at you, but it’s so discouraging that we live in such a disposable society, where things like clothing go out of style and are discarded after one season. And I’m not convinced that donating is as helpful as we think. Sure, thrift shops sell useful things to people who need them, but they must feel overwhelmed at the sheer volume of unwanted stuff that people give them. I really wonder if they can sell it all or if some donations just end up in the landfill. I hear you and don’t disagree with you – it’s not a good thing to just go through things without getting good use first. But I used the heck out of my old computer for four years, so I don’t think that would fall under being irresponsible. But the first step in reduce, reuse, recycle is reduce, so minimizing consumption is ideal. I think we all do our best to balance between what we need and what is responsible. Beyond landfills, some donation centres like Goodwill ship their leftover stock in large batches to developing countries, which effectively devastates local clothing production and eliminates industries and jobs in countries that already have high unemployment rates. Moreover, they don’t necessarily consider climate when shipping these secondhand clothes – when I worked in Haiti, I saw a lot of winter clothes around (snowsuits, winter jackets, etc.) that no one had use for. So it just created a lot of waste in a country that doesn’t have proper waste management. I think it’s really important to understand where your clothes will go if they don’t end up being sold in the store where you donated them. I would love to try the AirPods, but the opening of my ears are super small/tight. None of the in-ear style will fit me. I love Apple, but I wish they’d make those in different sizes for people like me. I have an old pair of earphones from Target that are actually made for kids, and I have to use the smallest size (it came with 3). I still love and use that earbud! What’s great about it is its so darn small that you can tuck it anywhere. 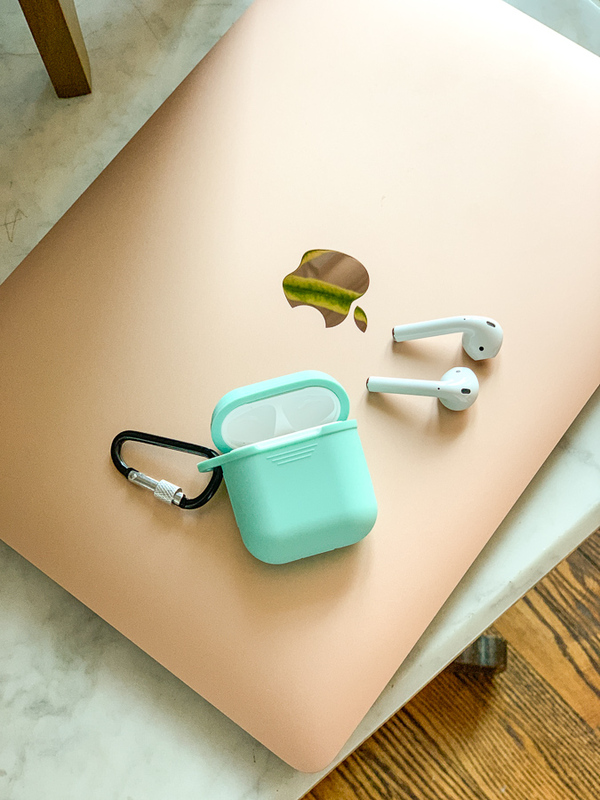 It’s also so inexpensive that I use it when I don’t want to take my Airpods that will be bulkier in my pocket or risk of theft or loss. And what a crazy story about the battery exploding! I’m sorry you didn’t have a good Apple customer service experience. They have been great the few times I have called. I am a Mac for life too! Have the AirPods and love them. Didn’t even know they made cases for them but now I NEED one! Could not find the color you had under the link you posted. Can you point me in the right direction? Please and thank you! AirPods are the best! I love them for running, and I feel they stay in place better than corded headphones! I also love how you can change the tap features for play/pause, next track, etc! I didn’t know about the case, but I think I need it! Would you consider devoting a post to the pros/cons of using Lightroom? I just got a new laptop as a present for finishing my PhD (hazaa!) and am now trying to determine which photo editing program to try for personal and professional use. Just a thought! All pros! And it’s what the pros use too (my photographer uses it.) If you are bulk editing, it’s the best. If you’re doing just one and doing fancy stuff to it, Photoshop might be better, but I think you can actually get a subscription for both that isn’t too much more than LR alone.